LK Chapman | Possibilities. Psychology. Fiction. I’m thrilled to unveil the cover for Found You (the first of two chilling sequels to my psychological thriller Anything For Him), and to announce its release date is the 30th April 2019! The Kindle edition is now available to pre-order on Amazon! After her imprisonment at the brutal hands of her ex, Jay, Felicity is slowly putting her life back together. She’s got a new name, a new hairstyle, and even a new partner: strong, supportive Scott, whose down-to-earth nature makes him the perfect stepfather to little Leo. Though the nightmares still haunt her, she’s starting to feel that her struggles are over; that she may, finally, be safe. But Jay is still out there somewhere. 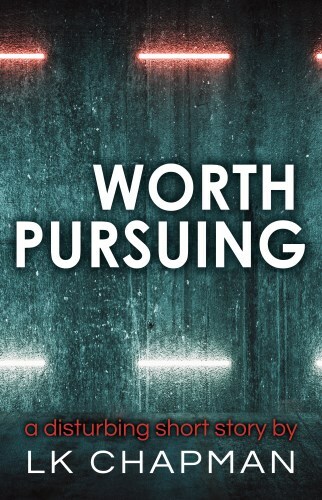 The story of a one night stand gone wrong… get your free copy of Worth Pursuing now! LK Chapman writes psychological suspense and sci-fi. Her first novel, Networked, was published in 2014- a fast-paced and emotional sci-fi thriller about video game developer Nick and his encounters with a strange entity who takes over his game, and before long, his life. Following on from this, in 2016 she published Anything for Him; a chilling psychological thriller about obsession, jealousy and revenge, and the fallout from an intense teenage love affair that eleven years on is still making itself felt. Her latest novel, The Stories She Tells, follows a man’s search for an ex-girlfriend who disappeared ten years ago, and the shocking lies and secrets he discovers when he tracks her down. LK Chapman plans to write more psychological thrillers in the near future, you can join her Reading Group to make sure you hear about new releases!